"Jamul will never be the same (if the Jamul casino is built). It would bring other big-city problems, more noise, more crime, more traffic, more light pollution." I am not sure if San Diego County Supervisor Jacob conveyed these words in an official capacity or as a local citizen, yet they bear discussion from an historical perspective. First, I will say to Ms. Jacob and her neighbors  yes, that's called "progress" and American Indians certainly know a thing or two about "progress." It seems not much has changed since the 1760s when droves of immigrants began entering present-day Old Town San Diego and constructing the California mission Indian system (slavery or salvation?). 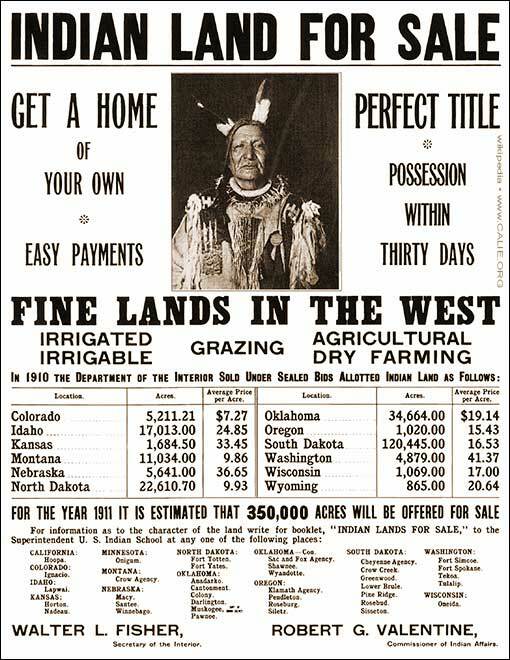 I will guess the immigrants called that "progress," too  not sure what the locals (the Natives) called it back then. Nonetheless, history in San Diego also tells us the immigrant government evicted the ill-prepared Kumeyaay people from their prime coastal areas by 1822. And in 1848 when the U.S. government won the Mexican American War and took control of the area presently known as the County of San Diego  with direct support from U.S. federal and state governments  local citizens inflicted unspeakable acts of genocide on the Kumeyaay people as white settlers continued to flood into homelands Kumeyaay families had occupied for some 600 generations. I guess good American people during this bloody period in San Diego's history remained silent in the name of "progress"  I doubt if even one Kumeyaay felt the same  yet San Diego's original peoples survived the next 150 years being pushed into east county rocks and languishing in abject and grinding poverty. 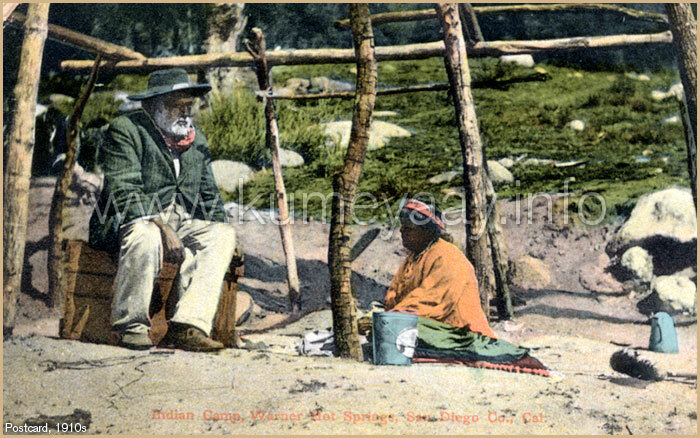 INDIAN CAMP, Warner Hot Springs, San Diego, Co., Cal. : This authentic hand-colored postcard was postmarked 1912. When it was produced at the turn of the 20th century, San Diego's surviving aboriginal people were peacefully seeking refuge in the harsh San Diego mountain desert backcountry, the only remaining ancestral tribal lands left for them. Only in the past several decades have a selected few Kumeyaay bands broken out of this intergenerational cycle of poverty through Indian gaming revenue. And now Jamul Indians are asking the U.S. government for a fair shake to build a small casino on their Indian reservation  and what are they getting from the local community? LAWSUITS. 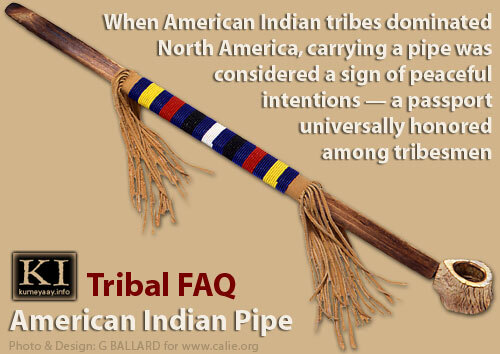 Legal actions aimed at protracting and denying Jamul tribal members from benefiting from the same opportunities of self-sufficiency that hundreds of other gaming tribes across the United States are currently receiving, including several local San Diego County Indian bands. "I urge you to not let history repeat itself by remaining silent and allowing a few local people, their power lobbyists and lawyers to deny Jamul tribal members of getting a fair shake with the government." As a special witness to this historical tribal "progress" provided mostly by Indian casino profits, I have researched and self-published educational study articles on KUMEYAAY HISTORY, AMERICAN TRIBAL SOVEREIGNTY and SAN DIEGO INDIAN CASINOS. As a concerned citizen, I urge you not to let history repeat itself by remaining silent and allowing a few local people, their power lobbyists and lawyers to deny Jamul tribal members of getting a fair shake with our local, state and federal governments. 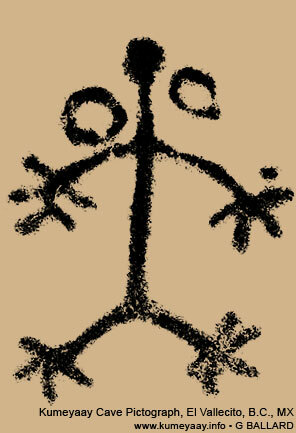 Ancestors of Jamul tribal members are believed to have occupied the San Diego area for some 12,000 years. Prior to the 1780s, the Kumeyaay tribe controlled the shaded area in the 1776 map below. 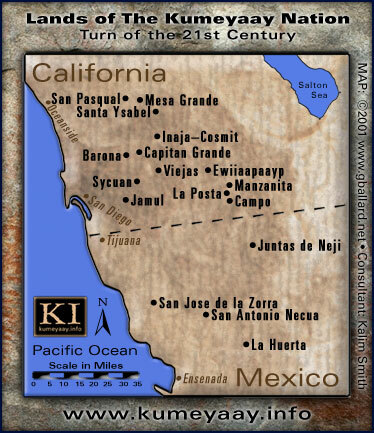 Prior to invasion, Kumeyaay territory ranged from the Pacific Ocean on its western boundry, south to Ensenada and east to Mexicali in Mexico, and north in the United States to San Pasqual in Southern California. PRE-CONTACT 10000 BC: Hard archeological evidence gleaned from hundreds of local indigenous sites clearly suggests the Kumeyaay indigenous people have lived in the greater San Diego and northern Baja California Mexico area for some 12,000 years (600 generations)! 1542 FIRST CONTACT: First European explorer in California, Juan Cabrillo, sailed into what is known today as San Diego Bay and made first contact with the indigenous Kumeyaay people. 1769 FIRST SPANISH MISSIONARY: Father Junípero Serra, established the first Franciscan mission in California near the ancient Kumeyaay village of Kosa'aay (Cosoy), known today as Old Town, San Diego. THE MEXICAN AMERICAN WAR (1846-1848): The Americans won the Mexican-American War and signed of the Treaty of Guadalupe Hidalgo with the Mexicans. This treaty between the United States and Mexican governments established the current US-Mexico border and divided California from Mexico. Moreover, it cut the international border through the heart of Kumeyaay ancestral homelands and alienated the northern Kumeyaay families from their southern Kumeyaay relatives. THE CALIFORNIA GOLD RUSH (1848-1855): The California Gold Rush changed the course California history by bringing the full weight of the Europeans' technology, diseases and greed for land and gold bearing down on the backward, ill-prepared aboriginal population. GENOCIDE: The discovery of gold in California exacerbated the cruel government-sanctioned genocide and local participation that seemed determined to wipe the indigenous California peoples from the Earth to silence their future mineral, water and land claims. It's been estimated that Europeans took some $10 BILLION (2002 dollars) in gold from historical California tribal lands between 1849 and 1862. Locally, some $5 million in gold was mined from the Julian Eagle and High Peak Mine during the 1870s. This mine is very near the present-day Iipay Nation of Santa Ysabel and Los Coyotes Indian reservations. Do you think the tribes ever received even one ounce of that gold in royalties? 1900: It's been estimated that only about 1,000 Kumeyaay Indians survived the 1800s due to the genocide, poverty and neglect. 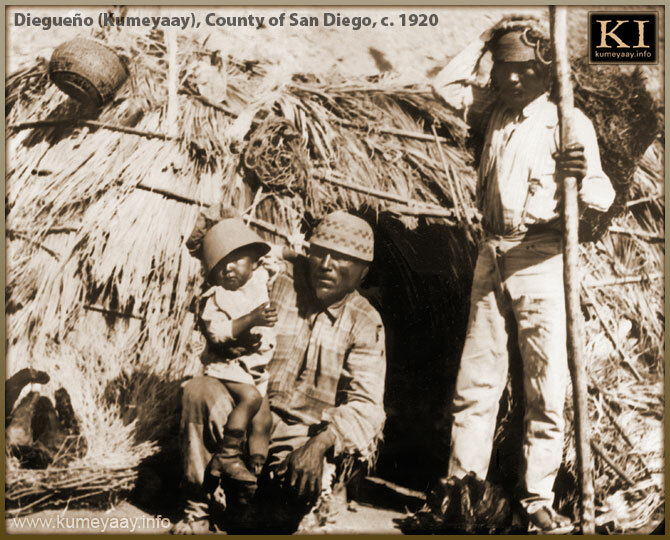 County of San Diego, circa 1920: Two Diegueño (Kumeyaay) men with child wearing Kumeyaay basket hats in front of an ewaa-style thatched shelter pose for a photograph, circa late 1800s or early 1900s. Man standing holding a staff, a tump line slung over his head supporting a bundle of fibrous material or basket container. Baskets and agave cordage net bags hanging off of exterior walls. Jamul Indian Village A Kumeyaay Nation is a federally-recognized American Indian tribe, a Sovereign Tribal Government operating on Sovereign Tribal Lands. As such, the Constitution of the United States, U.S. Supreme Court, state and federal laws  as well as historical Treaties with the U.S. federal government  all support Jamul's present-day legal rights to self-governance and certain limited forms of national sovereignty that must be honored today. Ultimately, I believe it is the responsibility of the federal government to ensure the Jamul band is treated fairly. 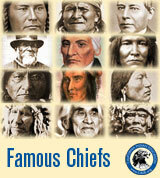 Department of the Interior (DOI), 2011  The Department of the Interior has a solemn responsibility to uphold the federal government’s unique government-to-government relationship with federally recognized American Indian and Alaska Native tribes, as provided for by the Constitution of the United States, U.S. treaties and court decisions, presidential executive orders and federal policies and administrative actions. We recognize that a legacy of injustice and broken promises shapes the history of the federal government’s relationship with the American Indian and Alaska Native people. We are therefore working to turn the page on the federal government’s pattern of neglect of this community and, instead, build a strategy for empowerment that helps the tribal nations forge futures of their own choosing. To chart this new path, we are restoring the government-to-government relationship between the federal government and these tribal nations because “self-determination,” “sovereignty,” “self-government,” “empowerment,” and “self-reliance” are not abstract concepts. 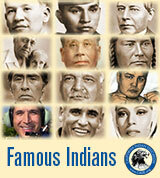 Rather, they are the tools that will enable tribal nations to shape their collective destiny. This is why Interior is committed to partnering with American Indian and Alaska Native communities to help them prosper by expanding education and employment opportunities for youth and adults, protecting lives and property by strengthening law enforcement, and building strong, sustainable tribal economies... SOURCE | PDF. BARSTOW, CALIF, July 1, 2011  Los Coyotes Band of Cahuilla and Cupeño Indians propose off-reservation casino/hotel project, according to a Department of Interior - BIA draft Environmental Impact Statement published in the Federal Register...PRNewswire breaking news article, July 1, 2011. BARSTOW CASINO and RESORT project website. READ THE BIA ENVIRONMENTAL IMPACT STATEMENT (PDF) published in the Federal Register, July 1, 2011 (Volume 76, Number 127). Unfortunately, this Southern California casino project appears stalled  is it because of local organized opposition or red tape? Click on map for in-depth study guide. 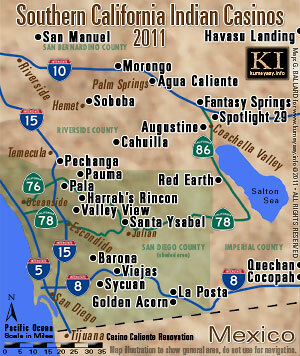 KUMEYAAY HISTORY in San Diego editorial essay, timeline and history of the Kumeyaay of San Diego County. 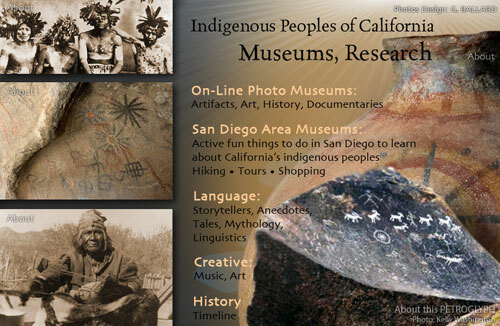 KUMEYAAY TRIBE AT THE SMITHSONIAN features the Campo Band of Kumeyaay Indians, aka Campo Kumeyaay Nation, and Campo Band of the Kumeyaay Nation. 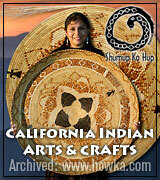 KUMEYAAY GATHERING of local Southern California Indians, pow-wow pictures. Kumeyaay Bird Singers, Sycuan Indian Reservation, Kumeyaay Community College (formerly DQ University at Sycuan), are pictured here in this photograph around a burning campfire learning and singing ageless traditional Yuman bird songs. Photo IDs: 1) John Christman (Viejas), 2) Paul Cuero (Campo), 3) Samuel Brown (Viejas), 4) Sam Q. Brown (Viejas), 5) Ben Nance (non-Indian), and 6) Dr. Larry Emerson (Diné). INFORMATION ABOUT THE KUMEYAAY RESERVATIONS. 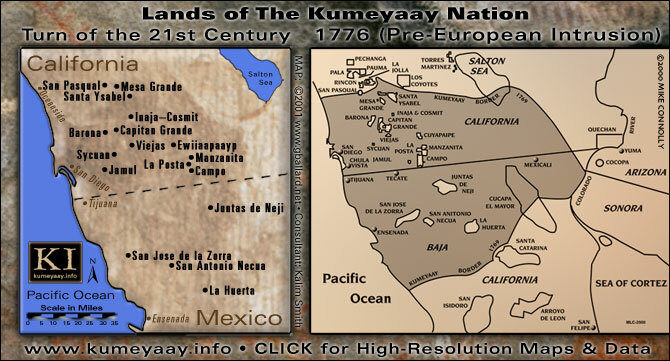 Historical MAPS OF THE KUMEYAAY (1776-present). 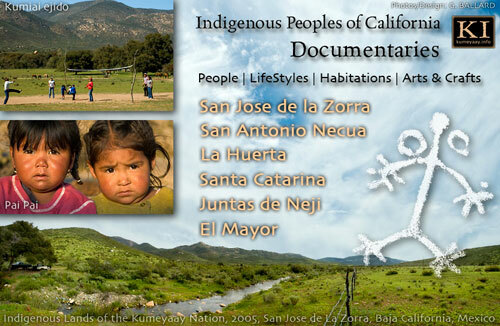 PROFESSIONAL PHOTOJOURNALISTIC DOCUMENTARIES  modern Kumeyaay lifestyle, housing, ethnographic art, indigenous tribal communities of Baja CALIF, MX. 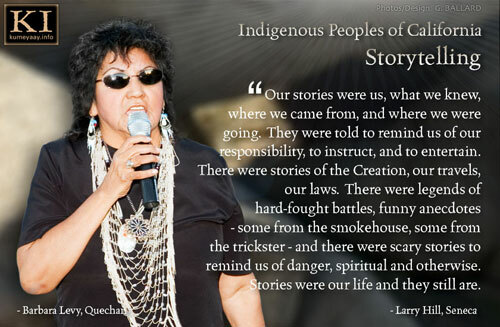 KUMEYAAY STORYTELLERS featuring Sam Brown's famous Kumeyaay stories of the Brown-Curo family of Barona and Viejas. 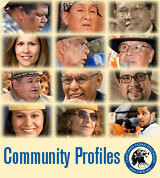 CALIFORNIA INDIAN COMMUNITY Profiles, today's leaders, who's who in Southern California Indian Country, education, culture, art, sports, spiritual, government. The information and commentaries expressed on this website are those of the person(s) who produced the work, and nothing else. This page was researched, written, designed and self-published by Gary Ballard, a photojournalist based in San Diego, CA. Ballard has worked professionally on Kumeyaay accounts as an independent contractor for more than 20 years. 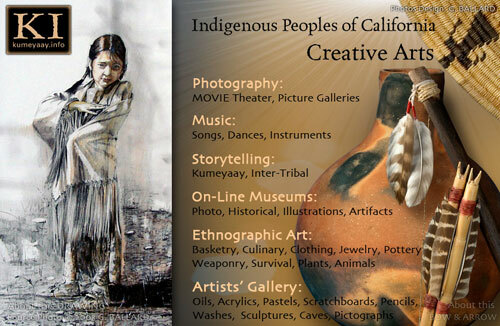 Kumeyaay Information Village Website values your opinion on California Native American Indian Issues. Please EMAIL US with your OPINION for publication on the KI site.